I have a Samsung RF4287HA fridge. 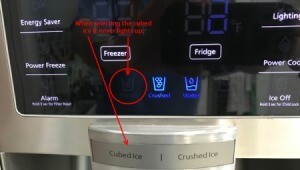 It will not dispense ice cubed or crushed, but does make it. Also if you select the cubed instead of the crushed it does not light up. Does anyone have an idea on what is causing this problem? Do you know if your fridge has a warranty for a free tech to come out and fix the problem? There are a lot of potential reasons according to online research so it's hard to self diagnose. Not a cheap fix either for some of the parts. Have you tried unplugging and plugging to see if a simple restart would help fix the problem? unplug and let your freezer and fridge thaw out...Then try it again. On my old fridge, that reset everything. Also check and see if your water filter needs replacing. There is an ice bucket auger motor. That could be in need of repair.